Writing book-length documents in MS Word has never been easier! 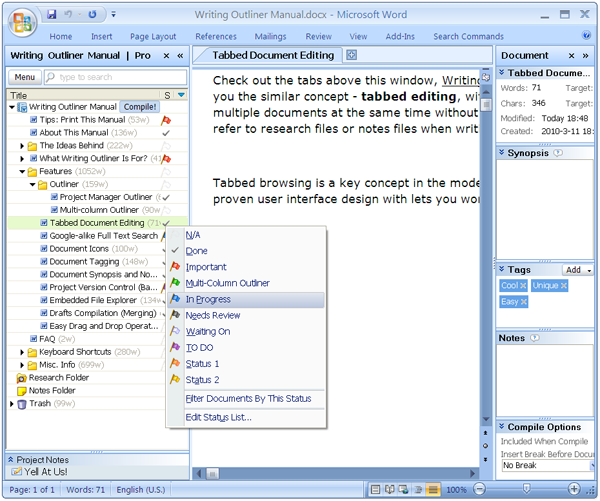 Writing Outliner is a seamlessly integrated add-in software for Microsoft Word, mainly for creative and professional writers. The most important concept of Writing Outliner is project-based writing. A project in Writing Outliner is a long or complex text that you might work on for days, weeks, or even months, for example, a book (novel, or non-fiction), a research paper, a serious of columns, a personal diary, or even a note book. With Writing Outliner, you manage and write each piece of your long writing projects as smaller separate documents, because smaller separate documents are more manageable for a long or complex wring project.